TATS A KOOL CHALLENGE: Ninth Day of December! 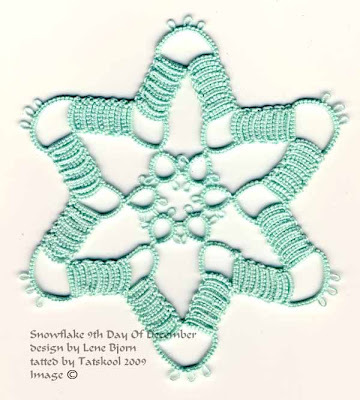 It would be interesting to see in two colors, to make the block tatting striped. That second color would only show up in every other row of the blocks, so you'd have to make it something eye-catching. PS- Got my Vanilla Sky yesterday. As soon as I saw it, I realized how much my mom would love it, so I'm edging a doily for her. That purply-blue shade is gorgeous! That really is beautiful. A great job, as usual. 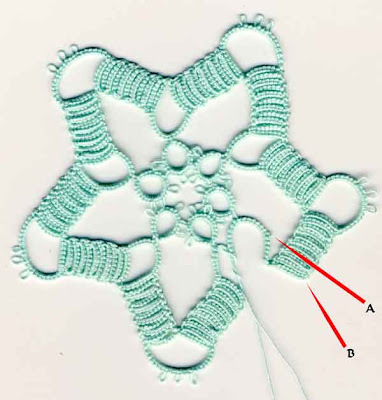 You mentioned how the photo is a reverse of the diagram. I have had the same problem. Why do you think that is? Is the diagram actually reversed in the book or are we tatting it backwards? ;) I look forward to seeing the rest of the month! I made the mistake of trying to tat this one in gold metallic thread the first time I tatted it. I did finish it but what a pain! breakage, breakage breakage! Never again. That's great Miranda, do show how it turns out. It would be interesting stripey....mmm. Hi Steph, All I can say is that the diagram and the photo should be facing the same way IMHO. I always have trouble knowing which way I should be going that's why I like numbered rings or at least some arrows. I went the wrong way the first time I started tatting this one and ended up in a real mess! and then I noticed the arrows! It's all a question of whether you are looking at the front or the back, I know that but I do need consistency. Hi Gina, I can just imaging the agony of that! I have never had a pattern go the same way as I tat. I just chalked it up to my left-handed tatting, sighed many heavy sighs and muddled through. It never occurred to me to print it out in a reverse image. LOL! So now I wonder if the diagram was created by a tatter who used the opposite hand that you do? Hi IsDihara, The reversed image is such a help. Normally it doesn't matter but with the last 2 designs it was so hard to get the tatting right. If the designer doesn't do frontside/backside tatting then I guess they just photograph it anyway up without a thought. Often in these patterns with a central motif I will start with wrong side so that I can tat the outer round the way that I prefer, then of course I may be going the opposite way from the diagram. But once I am started it doesn't matter. This discussion is getting way too complicated! Another beautiful snowflake! I love the color. When I get to this one, I'll be sure to flip the directions... thanks for the tip! Vanilla sky - that is a gorgeous colour, but perhaps block tatting won't be so efective in a variegate. Maybe a solid colour that will tone. So - my favourite, Rainbow bright for the chains, and yellow for the blocks - I'd like to see that! Hi Diane, any help i can give, just ask. Hi Maureen. gosh you don't expect much of me!!! that sounds like HELP!! I'd like to see that too...any volunteers!! Very very pretty! Another winner which doesn't surprise me at all!